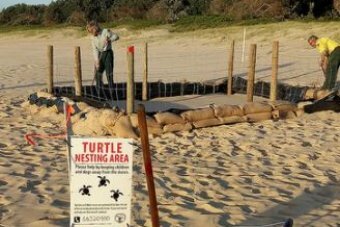 Coffs Harbour residents have been scrambling to save a rare green turtle nest at a local beach that is under threat of being destroyed by a massive king tide. 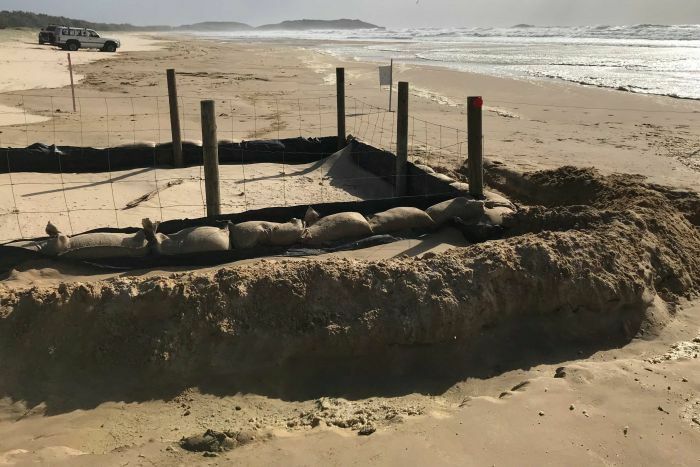 National Parks and Wildlife Service (NPWS) rangers joined residents at Boambee beach in a race to protect the site from the fast-rising water levels inundating the beach. The group began digging ditches and sandbagging the nest in order to keep it dry. “My mother is 85 and she’s lived here all her life and has never known of a turtle to nest on this beach,” one said. The crew managed to keep the nest intact, despite sea water flooding across the surrounding beach. 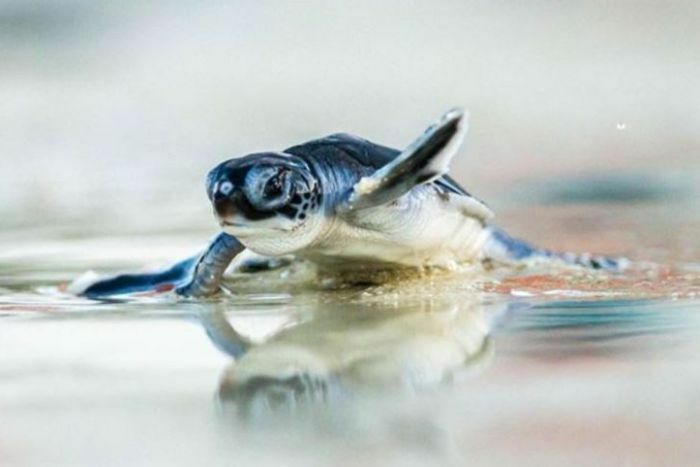 Last week an early morning fisherman followed tracks from the ocean towards the dunes when he saw an endangered green turtle laying a clutch of about 100 eggs, in what is one of the first nests to be recorded on that coastline. “It was such a surprise to find the turtle tracks, which looked like someone had rolled a large tractor tyre up the beach,” Mick Phillips said. “The real pleasure however was to see the turtle lay its eggs, cover the nest with sand then make its way safely back into the ocean. NPWS ranger Anne Walton said green and loggerhead turtles were on the brink of extinction in New South Wales. She said it was unusual and exciting to have a nest so close to Coffs Harbour. “They can lay several clutches in a breeding season and the mother could even return within a fortnight,” Ms Walton said. Rangers are expecting the nest will remain vulnerable to strong winds and damaging surf conditions hitting the coastline over the next several days. However, the clutch of rare eggs has more than the massive king tides to contend with, as the mother also happened to lay her eggs in the middle of a popular four-wheel-drive beach where locals are also allowed to run their dogs off leash. “People using Boambee Beach, especially four-wheel-drive users and dog owners, are asked to keep away from the nest site,” Ms Walton said. NPWS said it was fortunate the turtle was seen laying its eggs, because rangers could better estimate when they might hatch, but there were still a number of variables. “Sand temperatures are cooler than Queensland. Based on their studies it’s about 70 days, which would put it to Easter,” Ms Walton said.